There are a few things to consider when purchasing a new garage door. The opening method a door uses can make it perfect for you, or the exact opposite, as can the material the panels will be made of. If you’re not sure which specific options are going to be the right ones for your needs, it’s best to learn a little about the advantages and disadvantages each one presents. 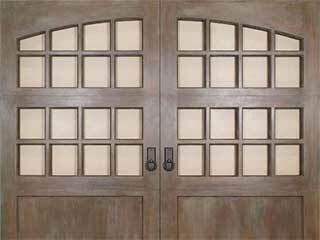 There are a few common materials used for the construction of garage door panels. They each have varying features and the door prices differ as a result. Wood has a classic beauty, and can greatly improve any home's curb appeal. However, it needs a lot of maintenance as it can break, crack, and warp, so yearly repainting will most likely be required. Steel, on the other hand, is the most durable of all the available materials. It doesn’t require a lot of maintenance, although it can corrode, especially if you in a moist climate. Its heavy weight will also require more horsepower to move, which means your opener will need to be suitable. Aluminum doors are lightweight and barely require any maintenance. However, they can easily dent and they do not provide good insulation. Apart from their panel material, garage doors can also be differentiated based on how they open and close. The most popular type is the overhead door. This door is the classic type, which moves upwards and rests parallel to the ceiling when it is fully open. This gives you ample space inside and outside of the garage, provided that you have enough backroom clearance. Instead of becoming parallel to the ceiling, the roll up garage door literally rolls up into a coil and rests just above the opening. A sliding door on the other hand moves to one side only, as its name may suggest. This type of door doesn't require a lot of backroom or headroom, but it does need a certain amount of sideroom, obviously. There’s also the side hinged door that swings open to the outside like a traditional front door. These require ample space outside the garage, which may not be convenient for every homeowner. It's not enough to just do some lazy research before deciding which door to get. There are a lot of pros and cons that need to be factored in, and you may not be aware of them all. That's why it's always a good idea to get in touch with professionals who can answer your questions and make sure that you don't neglect to consider any aspect. Our experts at Garage Door Repair Los Altos will be more than happy to help you with, as well as with the installation process of the new door.